Abbey's Vegetarian Recipes - nutrition for life, vegetarian cooking. Have a web site? Want to partner with us? Click here now! Subscribe now and receive a delicious new recipe every week by email! Get A Delicious New Vegetarian Recipe Every Week -- Plus My All-Vegetarian Holiday Recipe Collection! Hi! My name is Abbey and I've searched the world for vegetarian recipes, dessert recipes, and low fat recipes that are not only quick and easy to prepare... they're delicious! Join our community now and get one of these delicious vegetarian recipes every week by email. (You don't have to be a vegetarian to join us!) You'll also receive my mouth watering "All-Vegetarian Holiday Recipe Collection" when you sign up today! "Not being a vegetarian, but having a strong desire to live healthier, these recipes have been a Godsend. They have given me the inspiration to cook as I know I should, but had just never learned how." 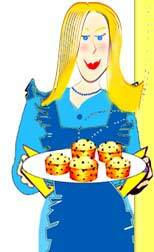 "What a delight to receive your recipes! I teach cooking classes in Houston and I highly recommend your wonderful service to people who are trying to learn to cook and eat vegetarian." If you get excited by yummy dairy-free vegetarian recipes, you're gonna love this one. For the smoothest consistency, use cashews or peeled almonds. Because of their alkaline nature, almonds help keep your blood at a neutral Ph. And if you buy them raw, they'll germinate when you soak them. Note for raw friends: Cashews are heated after being picked, even those labeled "raw". Soak 1 cup of almonds or cashews in 2 cups of water. If you're in a very warm climate, soak them in your refrigerator. After 8-12 hours, discard the soaking water and rinse the nuts. In a blender, place the nuts and enough fresh water to allow the blender to operate. Blend, gradually adding enough water to achieve a smooth consistency. Yields 1 ½ - 1 ¾ cups. Get More Recipes Like This! Thanks to Nomi Shannon for this recipe! Nomi was the lucky winner of the Abbey's Vegetarian Recipe Award. To get her free crash course on raw vegetarian foods, and find out about her rawesome pure vegetarian recipe book, The Raw Gourmet, visit www.rawgourmet.com. Be sure to mention that you were referred by Abbey's Vegetarian Recipes.